Iowa Secretary of State Paul Pate is asking legislators to quickly approve a bill that would require voters to show some form of identification before casting a ballot. “This bill will make it difficult to cheat the system,” Pate says. The bill Pate seeks would require Iowans to show a driver’s license, a military ID, their passport or a voter ID card issued by his office to be eligible to vote in their precinct on Election Day. Pate, who is a Republican, is asking legislators to set aside $1 million to ensure each Iowa county has an electronic poll book, to scan ID cards to check if the person is an eligible Iowa voters. Today, 27 Iowa counties lack electronic records for poll workers and the electronic poll books in other counties would have to be upgraded. Pate says his office needs more money, because state spending on elections has not increased for eight years. “That doesn’t paint the right picture or put us in a position to do the best job we can,” Pate says. Pate is also calling for voters who cast absentee ballots to put their driver’s license number on the ballot, so election staff can search voter registration rolls and confirm the voters’ signature is legitimate. 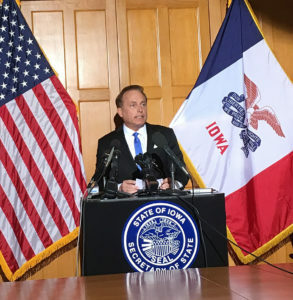 Pate’s staff just cross referenced DOT records and found seven percent of the Iowans who are currently registered to vote do not have an Iowa drivers license and would have to get an ID card from his office or use their passport or military ID to vote. Critics like Senate Democratic Leader Rob Hogg say there’s little evidence of widespread voter fraud and Pate’s proposal is a solution to a non-existent problem. “We need to invite Iowans in to a new era of citizenship and participation and positive service and part of that is voting and not creating artificial barriers,” Hogg said during the Associated Press Legislative Seminar on Wednesday. Pate today blamed the media for airing stories about things like alleged voter fraud and alleged Russian hacking to raise concerns about the legitimacy of the 2016 election.